Hero’s Equipment provides additional bonuses to combat and other stats, which gives you a considerable advantage over your enemies. 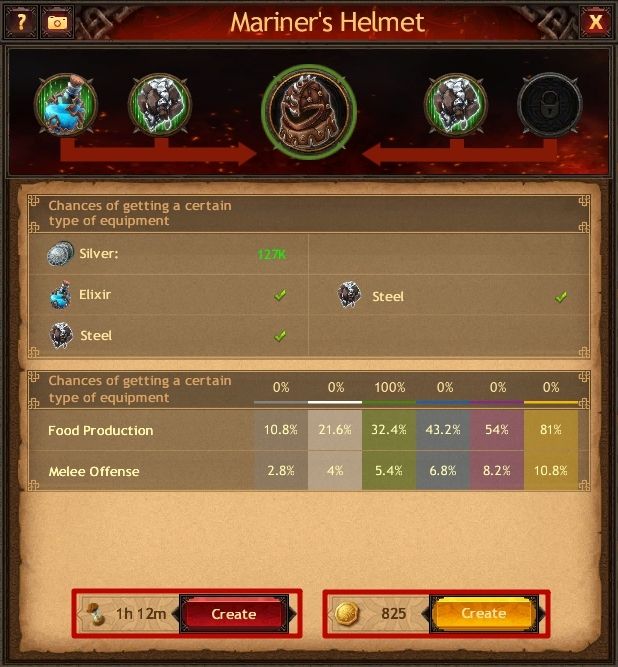 The Hero’s equipment can be crafted in the Forge (the Equipment tab) using the materials you can get for performing various game actions, or making a purchase in the Item Store. To craft a piece of equipment you must have a set of materials of the same type. The higher the type of the material, the more bonuses the equipment crafted from it provides. Standard equipment is crafted from standard materials that can be obtained by completing Tasks, attacking Invaders and Uber Invaders on the Global Map, and purchasing Coffers of materials in the Item Store and in the Clan Store. Invaders' equipment is crafted from special materials and grants you far better bonuses than standard equipment. Special materials can be obtained only by attacking Invaders and Uber Invaders, as well as by yielding in their Lairs. Special equipment is crafted using Drafts that are studied in the Arms Guild in the Stronghold. They are available for Clan members only.